Millet is ia favorite treat for all birds; especially the little ones. Hang in the cage or it can be used as a training reward. It is easy to digest, tasty and a great starter treat for weaning babies. Package contains 5 natural sprays. 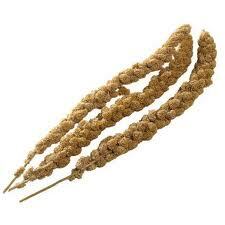 Ingredients: Millet on the stem. No additives.